Prototype: German Federal Railroad (DB) cab control car, 2nd class, for so-called lightweight express trains (LS). Type BDylf 457 with a baggage area without a side corridor. Colloquially also known as "center entry cars". Version with small marker lights at the ends near the top of the car and one-piece windows at the entries on the ends of the car. "Ocean Blue"/ivory paint scheme. Based at Hagen Main Station. The car looks as it did in 1984. Model: The car has a digital decoder. It also has triple headlights and dual red marker lights that change over with the direction of travel, will work in conventional operation, and can be controlled digitally. The car has factory-installed LED interior lighting that can be controlled digitally. The cab lighting can also be controlled digitally. The current-conducting couplers can be controlled digitally. The underbody is specific to the type of car. There are red transparent marker light inserts on the end of the car without a cab. The trucks are type Minden-Deutz heavy with double brake shoes. The truck at the end of the car with a cab has rail clearance devices, a "Sifa" (deadman's control system) relay box, inductive magnets, and a type D 62 generator. The minimum radius for operation is 360 mm / 14-3/16". Restroom downpipes and push/pull train control lines are included as separately mounted parts for presentation in a display case. Length over the buffers 28.2 cm / 11-1/8". Cars to go with this car can be found in the Trix H0 assortment under item numbers 23125 and 23165. 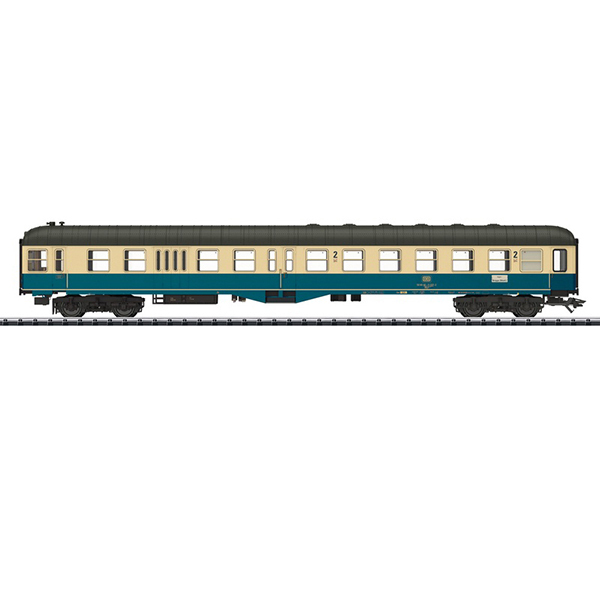 A diesel locomotive to go with this car can be found in the Trix H0 assortment under item number 22827. 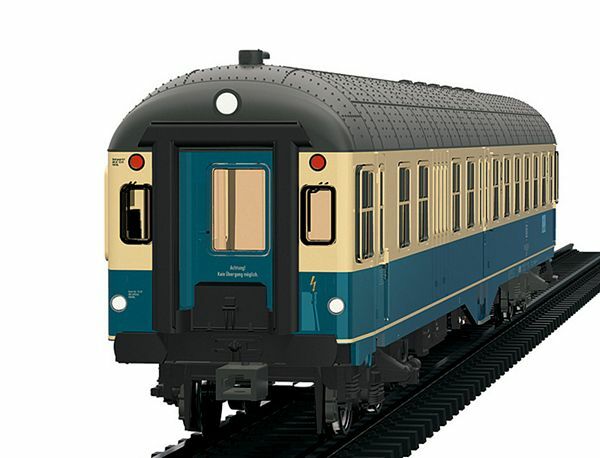 This model can be found in an AC version in the Märklin H0 assortment under item number 43335.